My largest, and probably most absurd commission to date, this 10-1/2-foot-wide chandelier features 175 canning jars, 60 chains made of cutlery, and over 1400 beer bottle caps. The entire fixture is lit with LED-filament bulbs to mimic incandescent lights while conserving power. It weighs an estimated 350-400 pounds and draws less than 5 amps. 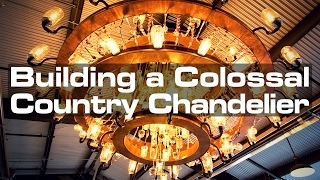 It was constructed for Quincy's Chicken Shack in Coppell, Texas, which shares a building with the Twisted Root Burger location that houses my enormous beer bottle chandelier. Stop by at 505 Houston St. to see them both in person! (https://goo.gl/maps/MhDJHoa...). ▶ Rodney Treat for help with delivery and installation. ▶ Tony Barsotti for the CNC router work (http://www.tonybarsotti.com/). ▶ Chris and Ryan of Metal Arc Welding for help with installation. ▶ Phillip Henderson for help with planning and installation.